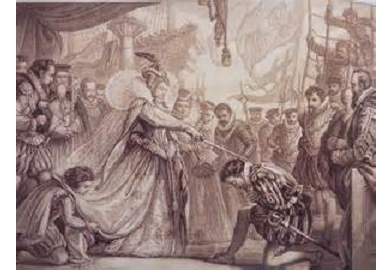 Sir Francis Drake (1540-1596) - The age of English naval dominance began in the late 16th century and was spearheaded by Francis Drake, who was the greatest sailor of his day and one of the greatest in England's history. As evidence, he led the second successful expedition to circumnavigate the globe between 1577-80, and lived to tell about it (unlike Magellan). Drake's career coincided with a rise in tensions between Spain and England and, as a result, he played a central role in the events which culminated in the Battle of the Spanish Armada. His attacks against Spanish vessels in the years leading up to the battle made him a hero in England and a hated villain in Spain. For him, the rivalry was personal. Francis Drake's introduction into history came in 1568, twenty years before Spanish Armada, when, as a young sailor, he tagged along on a business venture with his second cousin, John Hawkins (see below). Their small fleet of five ships was docked at the port of San Juan de Ulloa (on the Mexican coast) when it came under attack from a Spanish squadron (the reason for the attack is that the Spanish regarded them as pirates). Three ships were sunk, but the two ships commanded by Hawkins and Drake managed to escape. From that moment, Drake dedicated the rest of his career to exacting retribution on Spain. In 1572, he became a privateer (essentially a pirate sanctioned by the Queen of England to conduct raids on foreign ships and ports). That same year he captured the Spanish town of Nombre de Dios, which was the port from which Spain shipped its gold from Peru. But Drake was seriously wounded in the raid and his ships had to withdraw before they could secure the town. About a year later he relieved Spain of some 20 tons of gold and silver from a number of raids along the Spanish Main. So much treasure that he was unable to carry it all on his ships, and had to bury much of it for later retrieval (this probably is what gave rise to the notion of buried treasure). In 1581 he was knighted by Queen Elizabeth for his circumnavigation of the world. Then in 1587, only a year before the big battle, he conducted one of his most important raids against Spain. England knew that an attack was coming. Intelligence reports indicated that King Philip II was preparing for an invasion. So the queen approved a strike on Cádiz, one of Spain's most important port cities. The raid was a success with Drake destroying several Spanish ships and capturing four which were filled with supplies. As a bonus, on the trip back to Plymouth (the port of southwest England), he intercepted a Portuguese treasure ship (Portugal was allied with Spain at the time) and commandeered a substantial amount of treasure (10% of which Drake was allowed to keep). The expedition delayed Spain's attack by more than a year. And, of course, Drake played a very important role in the attack itself which came in 1588 (see Battle of the Spanish Armada below). King Philip II of Spain was so outraged over Francis Drake's actions that he was said to have offered a reward of 20,000 ducats for his capture or death ($6.5 million today).